Development of the jet fighter later to be named the Vampire began in 1941 and related closely with the development of the H-1 jet engine, for which was responsible the engine section of de Havilland company. The engine was known later under its new name the Goblin and its development was very successful. The Vampire was therefore ordered under Air Ministry specification E6/41 for an experimental machine able to be converted to a fighter plane. The design of the plane was fully adjusted to the new engine, which resulted in overall tiny dimensions of the airframe, very low undercarriage and the tail plane being carried by two slim tail booms. The first prototype, unofficially named the Spider Crab, flew for the first time on September 20, 1943 with G. de Havilland Jr at the controls. The trials were a success and an order for first 120 planes was placed in May 1944 and was continuously increased. The production planes were licence-built by English Electric since de Havilland was busy producing the Mosquito. The original name Spider Crab was rejected by the RAF and changed to the Vampire Mk.I. First squadrons got their Vampires in May 1945, too late for them to take part in the war. The development continued in further versions, besides the versions with the DH Goblin engine, there were also versions with the Nene engine (built in Australia), two-seat night fighter versions, two-seater training versions or naval fighter versions. The most widespread versions was the Mk.3 with more powerful Goblin and re-designed tail plane and fins and the FB.5 with shorter wingspan and airframe adapted for carrying out ground attack sorties. A new shape canopy was also used as a standard by then. The Vampire flew not only in the RAF and FAA, but also in many countries of all continents except for Antarctica. Complete list of all countries where this plane flew would be rather long. In some of them the Vampires were also licence-built. The Vampire indeed was a huge British export success of the post war period. 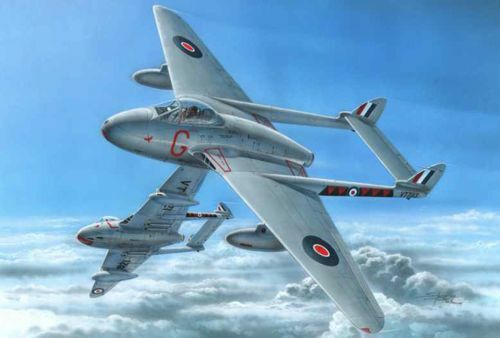 Owing to its elaborated and yet rather simple construction, relatively high performance and also because of favourable price, the Vampire often became the very first jet plane to see military service with many countries, not excluding the RAF of course where it served with large number of squadrons. 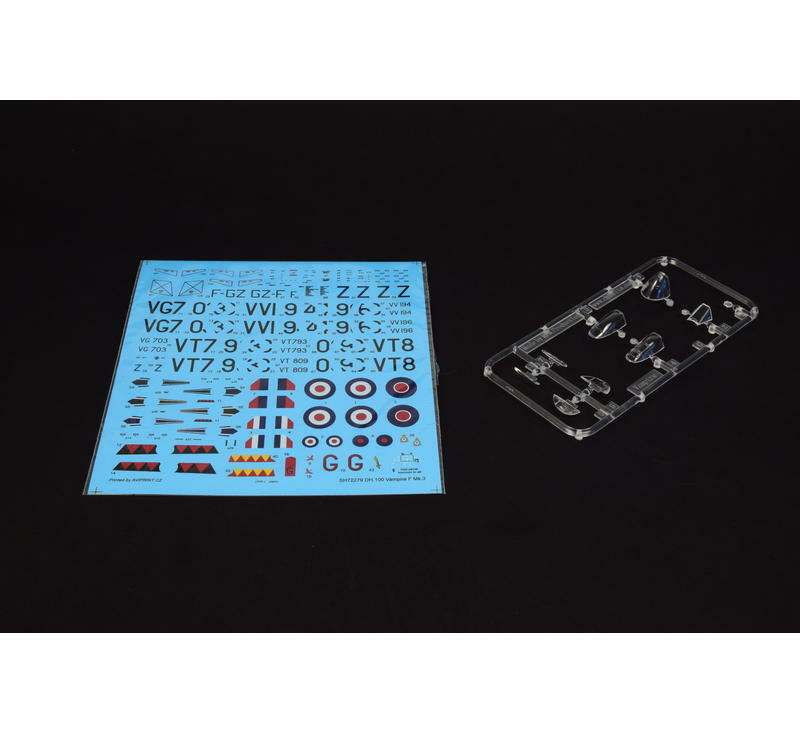 Our precisely detailed model was 3D designed to achieve excellent levels of quality, it is produced using long run steel moulds and comes on two grey styrene frames and one frame with clear parts of the canopy and wing tips (the latter to fit the Mk.3 version). The decal sheet brings markings for four RAF machines showing the wide range of colours born by the type after the war. As the whole batch of the kit is already completely sold out, we have prepared this re-release.